A new pharmacy has opened its doors at Majoie, introducing on the market a new range of pharmaceutical, therapeutic and cosmetic products for adults and children. OYA pharmacy is conveniently located in the Ravika’s building near the Guy Morel Institute and next to Rajesh Kanna store. 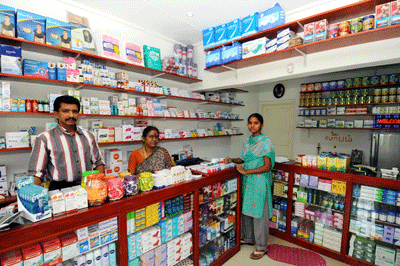 The pharmacy, owned by Rajesh Kanna, was officially opened last Saturday. It is open from 8am until 9pm Monday to Saturday, and from 8am until 1pm on Sunday. The pharmacist, Gunasekar Rajesekaran, said that with the time extension the clients will not get any difficulty to receive their medication after working hours. Mr Rajeskaran said: “There wasn’t a pharmacy is this region from English River to Glacis, so we decided to provide this service. Now clients are not forced to go to town and rush themselves out of work, as our door is open until late in the evening compared to other pharmacies which close at 5pm. We also have ample parking space,” he said. “We have brought new brands which are not available on the market from South Africa, India, Dubai and also Korea,” he said. “Aside from the time extension and the products we provide, the pharmacy will soon be receiving body analysers and other machines which will detect cholesterol or sugar level, among others,” he added.